Patrick O’N. 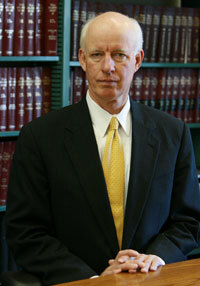 Hayes, Jr. is a member of the firm who has practiced law in Newport for over thirty years. He concentrates his practice in Estate Planning, Asset Protection, Wills and Trusts, Probate, and Real Estate Development. Mr. Hayes was born in Newport. He is a 1969 graduate of the College of the Holy Cross and a 1974 graduate of Suffolk University Law School. He served as Town Solicitor for the Town of Tiverton from 1978-1982, Legal Counsel to Rhode Island Senate Finance Committee from 1981-1983, as a member of the Committee on Professional Ethics and Responsibility from 1982-1983, and on the Steering Committee for the Newport Comprehensive Planning Commission. He was a director of the Newport County Chamber of Commerce from 1993-1999 and is a past director of the Newport County Boys and Girls Club. Mr. Hayes is a member of the National Academy of Elder Law Attorneys. He is on the Advisory Board of the St. Clare Home in Newport. Mr. Hayes has a wealth of experience in advising individuals on estate planning and probate matters, and guiding individuals and businesses through zoning and real estate transactions and other legal issues.